When I first saw that we would be making a "mustard tart" for this week's installment of French Fridays with Dorie, I wasn't sure what to think. A tart, with a predominant mustard flavor? My brief moment of doubt was put to rest when I scanned the ingredient list. Two kinds of mustard, dijon and whole grain, and copious amounts of creme fraiche are nestled into a tart shell (and oh, how I do love food that uses pie crust as a vehicle) with leeks and carrots. How could that be anything but delicious? 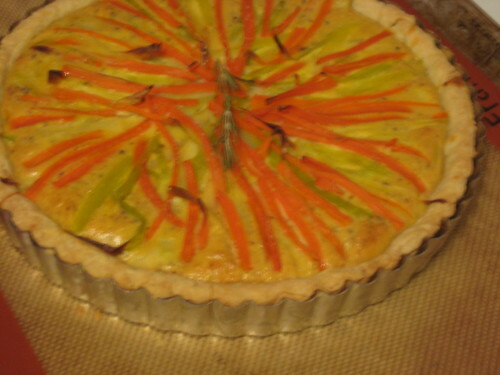 The tart filling was quite easy to prepare, though cutting the carrots and leeks into batons was rather tedious. The matchstick vegetables, arranged like spokes, do make a very attractive presentation, so that bit of work was worth it. The filling is creamy and rich, but the bite of the mustard keeps it tasting light. 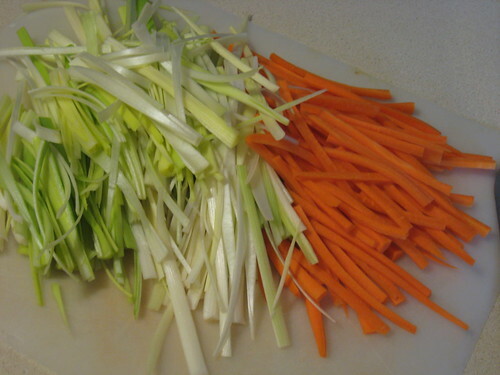 I liked the sweetness of the carrots, but I used too many leeks, so I found the flavor a bit overpowering. I am very much looking forward to making this with tomatoes, because I think I would like that version even more. Either way, a wedge of this with a big green salad makes a very satisfying lunch, dinner, or even brunch. There is one, fairly big, part of this tart in which I deviated from Dorie's recipe. As of yesterday morning, I hadn't yet received my copy of Around my French Table,* so I decided that I was going to use an easy tart shell that I have made before and loved. I could have asked someone for Dorie's recipe, but the truth is that I am lazy and I didn't want to have to parbake my shell. There, I said it. But even though I avoided it this time, I know I will be making versions of this tart in the future, and I am looking forward to trying Dorie's dough recipe. Pick up a copy of Around my French Table for this recipe (and over 300 more! ), and follow this link to see how my fellow FFwD-ers fared with their mustard tarts. *Actually, I received an e-mail from Amazon on Thursday morning saying that my order had been shipped, and at 4:30 it was delivered to my door. High five, Amazon! 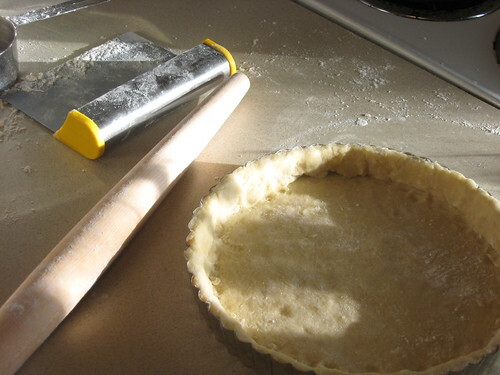 You really need to make the tart dough...the cookbook cost is worth just that one recipe! Lovely tart and great cutting skills. I loved this recipe--though i made the tomato version. Is that a Boston counter? I can totally tell one apart from counters in other cities.